Job creation eased in March, but the monthly employment gain nonetheless capped the best first quarter of job growth in six years. Additions to payrolls confirm that the economic recovery is maintaining momentum, while some of the headwinds to growth appear to be subsiding. Gas prices, while higher than a few months ago, have stabilized in recent weeks while concerns over eurozone financial difficulties have eased for now. April also marks the start of earnings season, and many companies are expected to report moderating profit growth. As much of the gains from cost-cutting measures and increased worker productivity have been wrung out, additional hiring will be required in the months ahead to drive increased profitability in the coming year. The private sector added 121,000 workers in March, while government agencies shed a scant 1,000 positions, resulting in a net gain of 120,000 jobs for the month. The economy generated 635,000 jobs in the first quarter, with almost all of them coming from the private sector. Nine of 10 private-employment sectors added workers in the first quarter, led by a gain of 196,000 professional and business services positions. 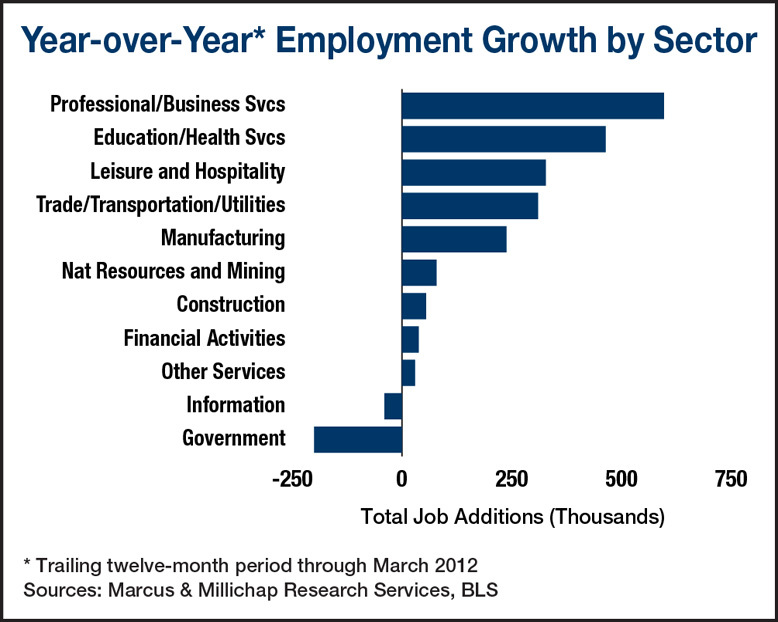 Education and health services added 134,000 jobs, as medical practices added staff to handle increased patient volume. More than 103,000 positions were also created at dining establishments, reflecting the continued loosening of household spending and greater confidence in the employment market. Only the information sector shed jobs from January to March. Rising consumption and the ensuing inventory increases underpinned a gain of 25,000 trade, transportation and utilities positions in the first quarter. However, the gain would have been greater if not for contraction in the retail trade segment, where 37,500 positions were lost in the first quarter. The loss of jobs reflects seasonal adjustments and may also count the closure of some Sears stores, and additional losses will be reflected in the coming months. J.C. Penney, for one, will eliminate 600 headquarter positions while Best Buy announced its intention to shutter 50 of its big box retail locations. A heightened pace of improvement in office property performance will become evident in the in the months ahead as more than 124,000 full-time, office-using positions were added in the first quarter this year, marking the eighth consecutive quarter of expansion. Though absorption has been slow to ramp up as companies remain cautious with office space needs, the national office vacancy ended 2011 at 17.3 percent. As hiring continues over the course of the year, tenant expansions will generate nearly 47 million square feet of net absorption in 2012, slashing 70 basis points from the office vacancy rate. The transportation and warehousing segment added more than 34,000 workers in the first quarter, offering a further indication of a recovery in the industrial property sector. Positive net absorption will exceed 45 million square feet of completions in 2012, resulting in a 90-basis-point drop in national industrial vacancy to 11 percent. Asking and effective rents will rise 1.7 percent and 2.0 percent, respectively, during the year, helping to partially erase losses posted in the preceding three years. This entry was written by marcusmillichap, posted on April 10, 2012 at 5:45 pm, filed under Research. Bookmark the permalink. Follow any comments here with the RSS feed for this post. Trackbacks are closed, but you can post a comment. love the theme/design), I don’t have time to look over it all at the minute but I have saved it and also added your RSS feeds, so when I have time I will be back to read much more, Please do keep up the fantastic job.